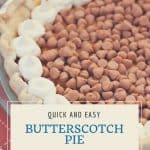 Butterscotch pie is so easy to make! 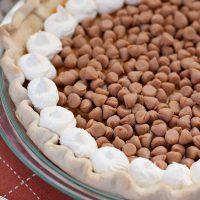 Start with a store bought frozen pie crust, whip together pudding from a box mix, and top with butterscotch chips. 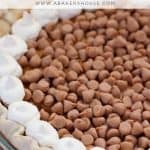 This pudding pie a perfect make ahead dessert! Happy Pi Day!! Celebrate with this butterscotch pudding pie. It is March 14th (or 3/14) which nicely lends itself to celebrating the numerical constant, Pi 3.14. Pi is the ratio of a circle’s circumference to its diameter. Too bad we have to think about our own circumference when we eat them. If you want to measure your pie, go ahead and try it. The ratio works! This is a day of pie for those who like math OR those who like pie, maybe a butterscotch pudding pie. Hooray! But let’s give a cheer on this day to our mathematicians– they deserve a celebration and since it involves pie, I love the idea! I think I first heard of Pi Day in college but can’t recall if it was the math or the engineering department who brought attention to it. I am sure we all ate the pie and enjoyed the snack break from our studies. I guess the celebrations are still going on. My friend is now a professor at the same college and I know she would enjoy any reason to share pie with her colleagues. I wish I had made this pie for her when she visited last week but my timing was off. Next time! Do you want to learn more about this fun celebration of Pi and pie? Click here for more. Pudding pies are nice to make from scratch (like this one) BUT if you need an EASY dessert or if you want to make something quickly and ahead of time, cut some corners and assemble this butterscotch pudding pie. Bake store-bought pie dough for the crust then follow the directions on the instant pudding box and pour the pudding into the cooled crust. Top with some butterscotch chips and whipped cream (I whipped a half cup of heavy cream with a generous pinch of sugar) and you are ready to serve. Honestly there is no need for a “recipe” (although one is included below) this is simply assembling the pieces of the pie to create something yummy. Refrigerate it for a few hours or overnight and it is as easy as that! Add to your Pi Day celebrations with these adorable Pi Cookies for Pi Day. Here are more pie recipes! Making pie can't get any easier than this butterscotch pie! 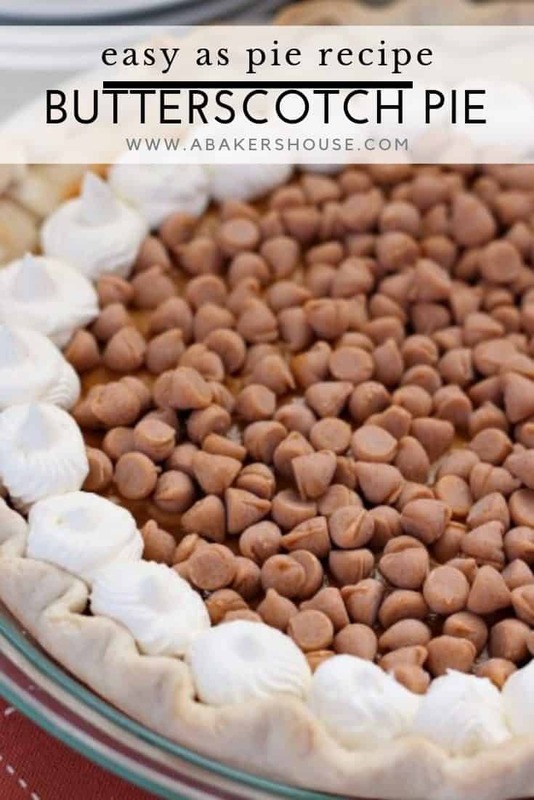 Use a store bought crust, pudding mix and butterscotch chips for an easy make ahead pie. Bake the store bought pie crust according to the directions. Let cool. Prepare the pudidng mix: bring 2 cups milk to a boil then whisk in the box of pudding mix. Let cool in the refrigerator. Fill the baked pie crust with the cooled pudding. Top with butterscotch chips. Whip the cream with 1 tablespoon confectioners sugar. Pipe the whipped cream onto the pie if desired. Use a gluten free pie crust for a gluten free dessert. I LOVE butterscotch pudding, and put it in a crust, well that’s what I call a great pie. This is a great way to celebrate any day. 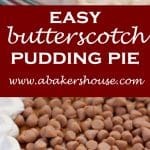 My mother used to make us butterscotch pudding quite often, but she never put it in a pie! Yum! Did I see you graduated from Swarthmore? My daughter graduated from Bryn Mawr two years ago and still is living in Philly. You think if I made her this pie, she’d fly home? Hi Abbe, I did graduate from Swarthmore and have played many field hockey and lacrosse games on Bryn Mawr’s fields. I even lived in Bryn Mawr after graduating. I grew up near there too. I hope your daughter is enjoying life there! And yes, pie is definitely a reason to come home to visit! Butterscotch pudding is my favorite. 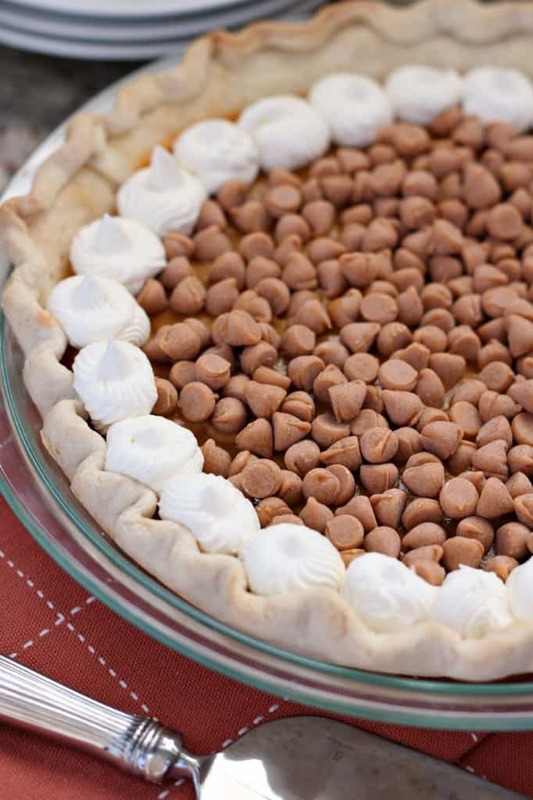 My mom used to make pies practically every day and her butterscotch was my favorite. As always really nice photo Holly. 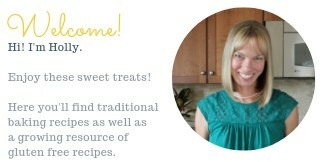 Thanks, Lea Ann, I would love to make pies every day but the trouble is that I would eat them every day too! What a wonderful way to grow up, though, you were lucky! You know I had my first pie making lesson from Barb and we made two pies in one night. I do take the easy route and just get the pie crust. I haven’t made a butterscotch pie .. Ha! Because I haven’t made many pies and that has to change. Mmmm. I love a good pudding pie. Made from scratch makes it even better but I’ll admit, I’m quite content with the boxed stuff. 🙂 Love your butterscotch pie, Holly! You know, Julie, I’ve been thinking about doing a series of posts that have baked goods made from scratch versus the short-cut, easy versions. Sometimes it is a toss up for which is better and other times it is hands-down better when homemade. 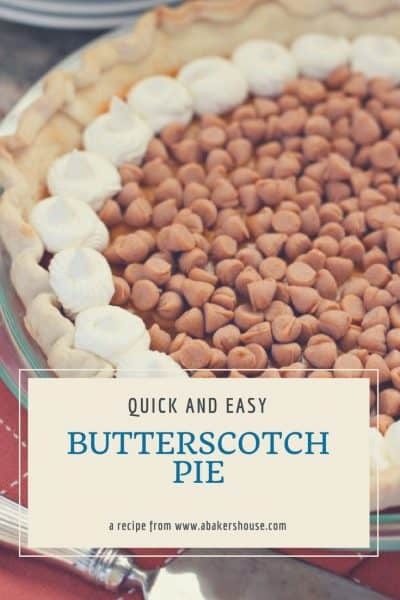 This butterscotch pie would be a good place to start!